Easter rain curtailed our activities somewhat and we ended up having a very quiet, serene Easter with our family. Easter Saturday we trekked out of town to visit my Dad and give him an outing. 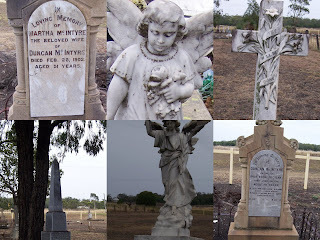 Where else would you go on a sombre drizzling day than a trip to a country cemetery. We were chasing some family history. Our ancestors have been in this district since the late 1800's and the land was foreign and harsh to them. They hailed from Argylshire, Scotland and found themselves in a hot and rugged environment. My great, great grandparents, Duncan and Martha McIntyre (nee Crombie) had eleven children of whom only 4 survived to adulthood. One of these children, Dugald, was only 6 years old when he died, and it was on a December day in 1877. One can only assume it was one of our very hot December days, as poor little Dugald died of sunstroke. His grave has just been discovered at a place called Lagoon Creek where a huge coal mining venture is taking place. A representative of the consortium was seeking our permission to move the remains to the Jondaryan cemetery where his parents are buried. We do not have a lot of information about the other children Duncan and Martha buried, but believe most were in very early infancy. My Dad really enjoyed this 'different' kind of outing and it was also good for some of the younger family members to learn a little of their heritage.